This week’s parasha is Vayetze, and begins with Jacob’s departure from the Holy Land towards Charan. 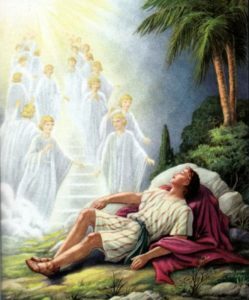 Along the way, he has his famous dream of the ladder ascending to Heaven. The Torah introduces this passage with an interesting set of words: “And he encountered the place and lodged there because the sun had set…” (Genesis 28:11) What does the Torah mean when it says that Jacob “encountered” the place, v’ifgah, as if he literally bumped into it? And which “place” is it referring to? Traditionally, this verse has been interpreted to mean that Jacob had arrived at the place, the holiest point on Earth—the Temple Mount. Indeed, after waking from his dream Jacob names the place Beit El, “House of God”. A more mystical interpretation has it that Jacob encountered God, as one of God’s names is Makom, “Place”. This Name of God denotes God’s omnipresence, the fact that God is everywhere, and more than this, that God literally is everywhere. God fills all space, and is every place. In his Understanding the Alef-Beis (pg. 153), Rabbi Dovid Leitner points out something incredible. When we think of place, or space, we think of area. Area is measured by multiplying the width and length of a space, or “squaring” it. This is why measurements of area are given in squared units, like square feet or square metres. 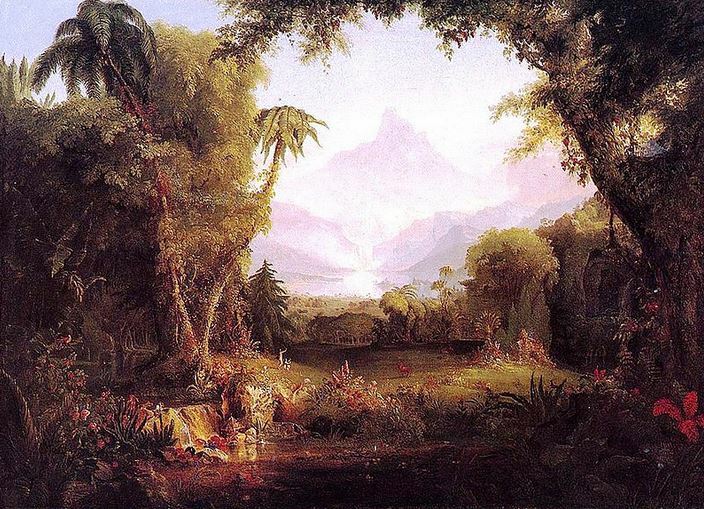 What happens when we “square” the values of God’s Ineffable Name? The sum of the “squared” value of God’s Name is 186, equivalent to the value of Makom (מקום), God’s Name of “Place”! Another of God’s lesser-known Names is El-Shaddai, literally “the God that is Enough”, or “the Sufficient God”. On the simplest of levels, it means that Hashem is the one and only God, and none other is necessary. The Talmud (Chagigah 12a) comments that this Name means that God is the one who told the Universe dai, “enough” or “stop”. This alludes to the origins of the universe, as God began His creation with a massive burst of instantaneous expansion which then quickly slowed down, as science has finally corroborated. Building on the Talmud, the Arizal saw within El-Shaddai an allusion to the tzimtzum, the primordial “contraction” of God’s Infinity to produce a “space” within which He could create a finite world. Rabbi Leitner points out (pg. 153) how “contracting” the letters dalet and yud of El-Shaddai makes a letter hei, which represents God. Our purpose is to similarly find God within this universe, which is nothing more than a contraction and concealment of God’s Oneness. Interestingly, both El-Shaddai and the letter hei are associated with reproduction and fertility. The first time that the name El-Shaddai appears in the Torah is when God comes to a 99-year old Abraham to bless him and Sarah with a child (Genesis 17:1). God adds the letter hei to their names, thus altering their fate and making them fertile. The second time El-Shaddai appears is in Isaac’s blessing to Jacob: “And El-Shaddai will bless you, and make you fruitful, and multiple you, and you shall be a congregation of peoples.” (Genesis 28:3) Similarly, the third appearance of this Name is when God Himself blesses Jacob: “I am El-Shaddai, be fruitful and multiply, a nation and a congregation of nations will come from you…” (Genesis 35:11) Not surprisingly, some have made the connection between El-Shaddai and shaddaim, the Biblical word for breasts, the latter being a symbol of fertility. 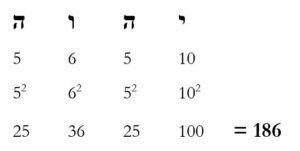 Meanwhile, the Arizal points out (Sha’ar HaPesukim on Vayetze) that because the letter hei is associated with fertility, Rachel was the only wife of Jacob that struggled with infertility, since she is the only wife without a hei in her name. (Leah, לאה; Bilhah, בלהה; and Zilpah, זלפה were the other wives.) Since changing one’s name is one of several things that can change one’s fate (along with charity, prayer, repentance, and changing locations, as per the Talmud, Rosh Hashanah 16b) it has been suggested that a woman struggling with infertility may wish to change her name to one that has a hei in it. Today, there is a long list of segulot to help woman conceive. One is for a husband to be called up to the Torah on Rosh Hashanah for the haftarah reading of Hannah, who also struggled to conceive before being blessed with Samuel. Another is for a woman to immerse in the mikveh right after a pregnant woman. A third is having the husband light Shabbat candles first (without a blessing), then having the wife extinguish them, and relight them (with blessing). This is said to be a tikkun for the sin of Eden, where Eve caused the consumption of the Fruit and the subsequent “extinguishing” of the divine light. The woman relights the candles that she extinguished, thus performing a spiritual rectification. Rav Ovadia Yosef was not a big fan of any of these or other fertility segulot, but did hold by one: consuming an etrog after Sukkot. Having said that, because etrogim are very sensitive species and are typically not eaten anyway, they are cultivated with massive amounts of pesticides and other chemicals. They should be washed thoroughly and eaten sparingly. Lastly, there are those who maintain that the best segulah for fertility is to go to a fertility doctor! This entry was posted in Jewish Law & Life Cycle, Kabbalah & Mysticism, Mysteries & Origins and tagged Abraham, Adam and Eve, Arizal, Beit-El, Bilhah, Chagigah (Tractate), Charan, Creation, El Shaddai, Etrog, Fertility, Forbidden Fruit, Garden of Eden, Gematria, God's Names, Hannah, Hei (Letter), Isaac, Jacob, Jacob's Ladder, Kabbalah, Leah, Makom, Numerology, Rachel, Rav Ovadia Yosef, Reproduction, Rosh Hashanah (Tractate), Samuel, Sarah, Segulot, Sha'ar HaPesukim, Shabbat Candles, Temple Mount, Tikkun, Tzimtzum, Vayetze, Zilpah on November 20, 2017 by Efraim Palvanov.